This homemade costume for pets entered our 2011 Halloween Costume Contest, and won 2nd place in the Best Pet Costume nomination! The inspiration for mine and my dog's costume this year was her current hairstyle. Her costume is reconstructed from a baby's baptismal shirt and elastic waistband pants. The stripes are acrylic paint. My costume was made out of a large piece of red cloth, painted with a black permanent marker. 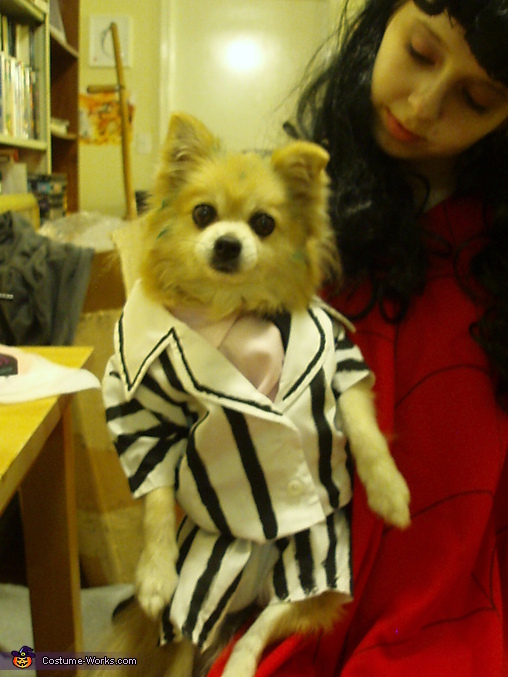 This is so cute I love this little beetlejuice beetlejuice beetlejuice. Oh no I said his name three times.